Luggage Tags are an inexpensive way to promote your company and will carry your message wherever your customers travel. 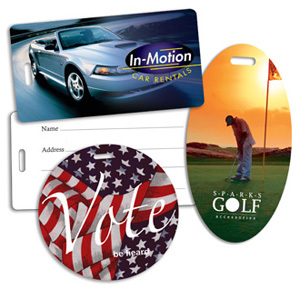 They can be printed in the large rectangular shape, a smaller credit card size, large oval shape or the circular shape. Please contact Plastic Works to discuss other options available. are available for Key Tags.